XtraOrbit Review 2019: Is XtraOrbit a Good Hosting? Romanian web hosting company XtraOrbit provides affordable shared hosting services that include excellent storage relative to the number of domains hosted and excellent customer support. XtraOrbit is a Romanian company that offers a variety of web hosting solutions including shared hosting. Their shared hosting plans are very affordable and provide excellent storage and customer support. This service is excellent for anything from a single personal blogging website to a network of thriving e-commerce sites. Usually, we’d share about the five-minute ticket response times in the Pricing & Support section, but it’s so rare to see such fast service that it deserved to be listed here. Note that if you choose to use WordPress, Drupal, or Joomla, you can expect it to run 19-31% faster due to XtraOrbit’s CMS server optimization. If you’re a beginner, your best option is to use their one-click installer that includes WordPress, Joomla, and many popular CMSes and apps. They don’t offer a website builder, so there’ll be a bit of a learning curve if you don’t already know WordPress or whatever CMS you choose. For everyone else, you can use cPanel access to build your website. Note that despite being a Romanian web hosting company, their data center is actually located in Michigan, United States. This data center isn’t wholly owned and operated by them; they’ve simply migrated all of their servers to the location. That said, they’ve also partnered with quite a few other data center operators and network points of presence (PoPs) around the world to provide their customer base with over 2,000Gbps of global connectivity. The Basic and Pro plans are relatively solid with decent storage and high bandwidth relative to the number of domains hosted. However, the number of available databases is lacking. Personally, I’d go with the Unlimited Everything plan: even if you’re just hosting a single domain, the difference in price is small and comparable to first or second tier pricing on other web hosts. The Unlimited Everything plan is by far the best value for money with XtraOrbit. Also, one great feature with Unlimited Everything is a free domain for life. That alone will save you the equivalent of two to three months of hosting fees a year. Also, they offer free SSL certificates on ALL websites, not just one. That will also save anywhere from $20 to $40 per domain per year over other web hosts that charge for extra SSL certificates. XtraOrbit offers excellent customer support. They generally recommend you send them a support ticket as that’ll get you the fastest replies, but they also have a toll-free number you can call 18 hours a day, seven days a week. Plus, they provide live chat support, but it was offline when I tried to access it. Their knowledge base is quite extensive and excellent for the DIYers out there. As mentioned earlier, they respond to all online ticket requests in five minutes. If you’re looking for reliable shared hosting with excellent customer service, XtraOrbit is a company to put on your shortlist. For those looking to save money, the Unlimited Everything plan offers serious savings with a free domain for life and free SSL certificates for all websites hosted. 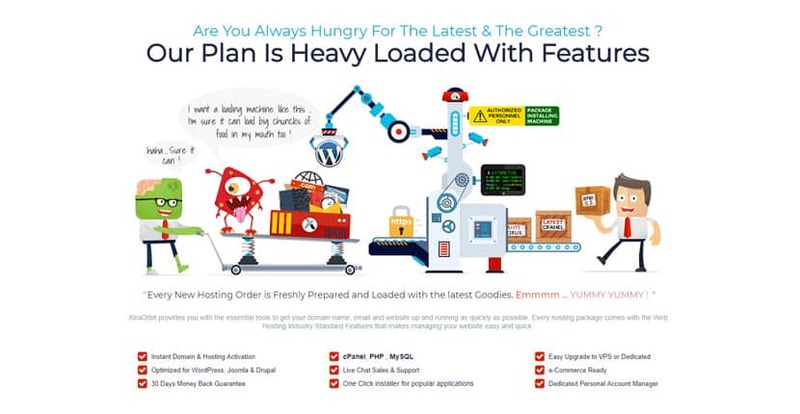 Wondering how XtraOrbit stacks up against other Web Hosting companies? Enter any other Web Hosting company and we will give you a side-by-side comparison.